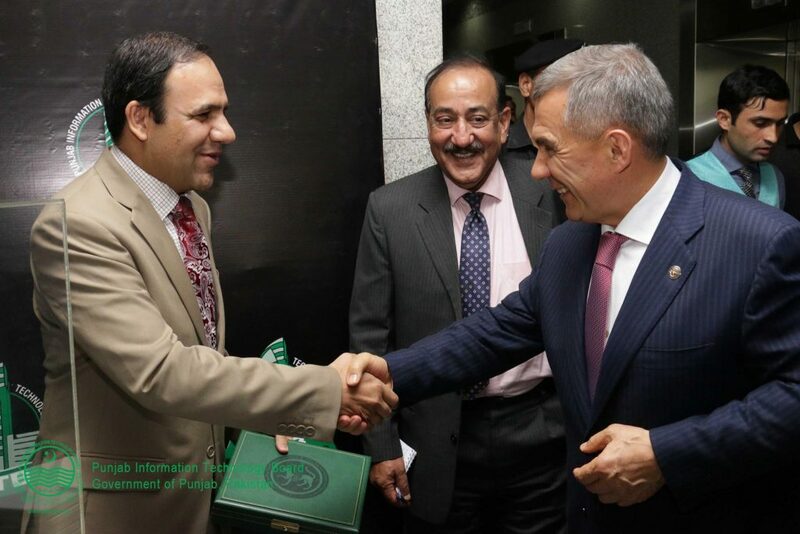 President of Republic of Tatarstan, Rustam Minnikhanov, visited Punjab Information Technology Board (PITB) to get apprised with PITB’s most acclaimed projects. Chairman PITB, Dr. Umar Saif, and team presented a detailed overview of PITB’s cutting-edge, ICT ventures in the health, education, law & order and public service sectors that have brought a progressive governance shift in Punjab and beyond. Both heads signed an MoU to partner on opportunities in Startup Incubation and various educational avenues with Information Technology University. “There is so much to learn from PITB’s exemplary ICT initiatives and we look forward to learning from them,” said President of Republic of Tatarstan. Republic of Tatarstan’s State Autonomous Institution Kazan’s IT-Park is a technology park that supports innovative companies at the early stage of development and provides opportunities for the creation and development of numerous IT companies in the Russian Federation. IT park Kazan, Punjab Information Technology Board (PITB)’s Center for Entrepreneurship PlanX and Information Technology University (ITU) have signed a joint Memorandum of Understanding (MOU) to explore the possibility of the joint startups, exchange program of startups and mentors and innovations development process in Russian Federation and Pakistan. This Memorandum reflects the mutual agreement of both parties to promote and encourage the development of technologies, as well as bilateral trade and investment relations. The MoU primarily covers the areas of cooperation in Information sharing and technology collaboration. The collaboration will be through technology transfer, investment, bilateral contacts and partnership development between startups and IT companies of both sides. It will encourage innovative industries of economy in both countries through joint ventures, technology cooperation or training and infrastructure support of the innovative enterprises at early stages of development. The important areas of MoU are joint development of educational and acceleration programs through incubator/accelerator partnerships between both entities, student exchange partnership between ITU Kazan and ITU Punjab Pakistan, support in the exploration and implementation of Kazan’s e-education system for emulation in Pakistan, development and realization of concrete actions and development and implementation of specific events.